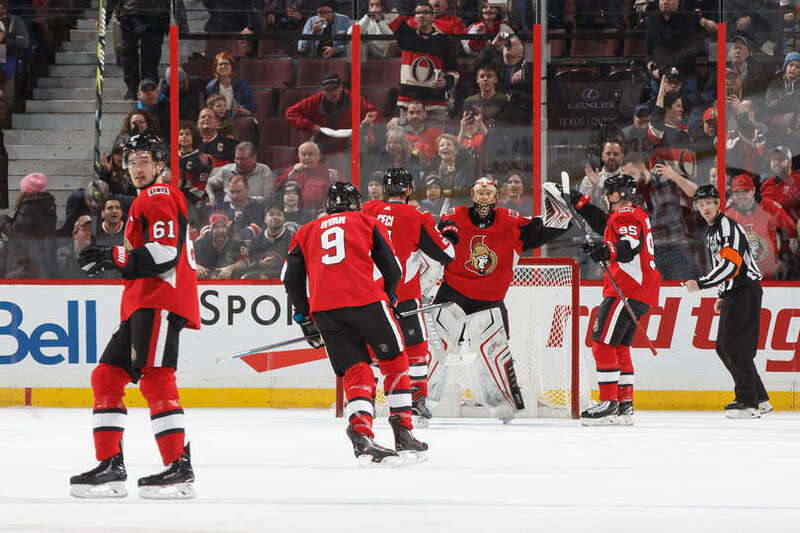 OTTAWA — Bobby Ryan had a goal and an assist and Craig Anderson made 27 saves to help the Ottawa Senators to a 3-2 win against the New York Rangers at Canadian Tire Centre on Wednesday, ending the Senators’ five-game losing streak (0-4-1). Cody Ceci and Zack Smith also scored for the Senators (10-13-7), who won for the second time in 14 games (2-10-2). Michael Grabner and Pavel Buchnevich scored for the Rangers (16-12-3), who lost their second in a row and third in four games (1-2-1). Henrik Lundqvist made 27 saves and became the 15th goaltender in NHL history to make 20,000 saves. Ryan said the win helped ease the sting of a seven-game road trip in which the Senators went 1-5-1 and concluded with a 3-2 loss to the Buffalo Sabres on Tuesday. “Our expectations were to do better on the trip,” Ryan said. “We let some points get away. To come back and regroup less than 24 hours after getting home from a 15-day trip and to get two points at home is huge. Smith scored his second goal of the season eight seconds into the third period when he took a pass from below the goal line from Tom Pyatt and beat Lundqvist to make it 3-1. Smith lost the draw to J.T. Miller, but Pyatt got the puck and skated down the left wing before passing to Smith in front. Forward Chris Kreider did the work on Buchnevich’s goal at 4:40 to make it 3-2, bursting past Ottawa defenseman Johnny Oduya on the right-wing boards to set up Buchnevich’s 11th of the season. Ryan gave the Senators a 1-0 lead at 4:01 of the first period, scoring his second of the season on a pass from Mark Stone. Grabner tied it 1-1 at 3:57 of the second period when he skated in behind Erik Karlsson at the left post and put in a pass from Mats Zuccarello. Ceci scored for the second consecutive game when he took a pass from Matt Duchene and took a shot that went past Lundqvist’s glove, with Ryan providing traffic in front, at 15:08 to make it 2-1. Ceci’s goal at 15:08 of the second period. Anderson’s save on Ryan McDonagh with 2:43 remaining in the third period. Smith’s goal eight seconds into the third period. Defenseman Marc Staal played his 720th game with the Rangers, passing Andy Bathgate for 11th place. … Ceci led the Senators with five shots on goal, 10 shot attempts and six hits.